Weighty Matters: Heart and Stroke Foundation Health Checks candy! Actually more like candy fortified with extra sugar. "But Yoni, the advertisement for the Del Monte Fruit Twists says says there's "no sugar added"." With the exception of natural flavour, colour and pectin the only ingredients are fruit concentrates. Wanna guess what the main ingredient of fruit concentrates are? Sugar. So much sugar that in each and every Health Check'ed serving of Fruit Twists there's 3 teaspoons of the stuff which account for nearly 70% of each serving's weight and 80% of each serving's calories. Buy hey, it's "natural" sugar, right? 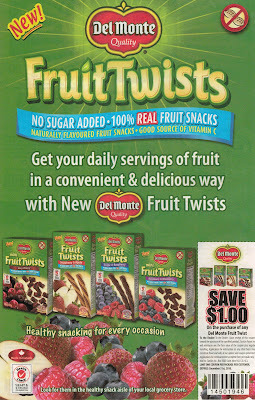 "Get your daily servings of fruit in a convenient and delicious way with new Fruit Twists"
Let's compare blueberries with Blueberry & Raspberry Del Monte Fruit Twists. Gram per gram the Health Check'ed Twists have 600% more calories and 666% more sugar (Hmmm). Put another way, if you wanted to consume the equivalent number of calories from berries as you'd get from a two Twist "serving" you'd need to eat 3/4 of a cup of blueberries (and that 3/4 of a cup still won't give you the sugar of the two tiny Twists). But as with virtually everything Health Check'ed it gets worse. Given that the Twists look exactly like Twizzlers, I decided to compare the two. Comparing Del Monte Fruit Twists - endorsed by the Heart and Stroke Foundation's stellar dietitians - with Twizzlers, gram per gram we see identical calories and get this, 40% more sugar in the Health Check'ed Twists. So once again here we have the dietitians from the Heart and Stroke Foundation discouraging the consumption of actual fibrous, nutritious, satiating fruits and berries by promoting and endorsing a heavily processed product that's basically just a sugar-sweetened Twizzler. They sure seem like a smart bunch. As far as I'm concerned, the misinformation the Heart and Stroke Foundation is providing Canadians should be downright criminal but sadly there's no law that prevents them from abusing the public's trust.